Toe’s Up!! It’s a injinji Sock Review and Giveaway!!! | Todayz Run!!! Toe’s Up!! It’s a injinji Sock Review and Giveaway!!! Toes are in white, fingers are in black!! Are you ready to have the same enjoyment pulling on a pair of socks that your kids get from pulling on a pair of their favorite fun colorful toesocks. Well I have to say when the injinji Performance Socks arrived at my house it was all smiles!!! I didn’t know what to expect with these socks, because I had never tried toesocks before (not even as a child. Yep, I think I might have been neglected!!) I was really worried that they might bug me, because I thought that my toes really liked being free!!! So, I decided that before I got out on a long run I would just give them a whirl around the house, so with that, on went the toe socks. At first I thought, Hey, wait they do feel a little weird!! Well this initial feeling went away fast as I think that my toes were happy to have some individual attention!! My toes did not realize that they were actually being trapped together when I was wearing regular socks. So, walking around the house in just the injinji socks (wait that doesn’t sound good. I did have clothes on, I just was not wearing shoes over my socks) I realized that I had the same comfort as just being barefoot, which is my favorite way to go!!! I know my toes really look like fingers!!! shoes on I had that same, wait these feel a little different, feeling at first. However, as soon as I was running they felt great!! The cushion level with the injinji Performance sock is just right. Not too thick and not too thin, but what I liked the most was the comfort of the sock. They are soft even after washing them many times. membrane that is light and breathable. Seamless in construction, the Performance Toesock™ forms to every contour of your foot. This allows for true restriction free and natural movement from your heel to five toes. This design encourages healthy circulation and eliminates skin on skin contact between your toes to prevent blisters. The socks also have AIS: Technology which is describe in the picture below. 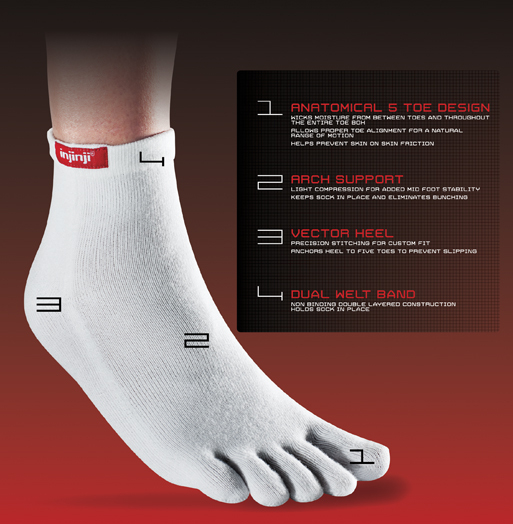 So, would you like to try a pair of injinji socks from the Performance Series for yourself. Then enter the giveaway. Toe’s Up!! It’s a injinji Sock Giveaway!!! Yes, my toes have amazing skills! 2. Put a comment on your Facebook wall. Okay this one could get a little tricky for you, so if you figure it out you will get a bonus entry!!! Read this entire section before you try it. Now to get this to work you will need to “like” Todayz Run and injinji footwear on Facebook. You will have to “share” this post with everyone. (you do this just by clicking on the picture of the lock and selecting “everyone”. p.s. it will only share this posting with everyone) Then when you are writing the comment you will need to put the @ symbol before both injinji and Todayz run. (While you are typing it you will see the pic for the page. Just click on it and it will automatically put in a link for you.) You will know you did this correctly if you go to Todayz Run on fb and you see your wall posting. (Go here to “like” Todayz Run. Go here to “like” injinji footwear, inc. Come back to Todayz Run and leave a comment, that you are amazing and figured it out!!!) If you need to see what it should look like, I posted it to my fb wall, so you will be able to see my link on Todayz Run Facebook Wall. Good luck with this one!!! Jennifer, don't tell me to get my "finger toes" off you!!! This entry was posted in A Runner's Thoughts!, Giveaways, Product Review, Ramblings and tagged A Runner's Thoughts!, Giveaway, Product Review, Ramblings. Bookmark the permalink. 28 Responses to Toe’s Up!! It’s a injinji Sock Review and Giveaway!!! I am subscriber of Todayz Run. I really want the Ex-Celerator Compression socks. love the pic’s you are way cute!!!! Went to the Injinji website…I’m likin’ the performance series micro…in pink!! You did it!! Good Job. I am so a Todayzrun subscriber! I also Love Todayzrun giveaways. They are the best! I like the pink ones from the performance series micro. I emailed this link to all my BFFs. I am so amazing! I did it! I posted on my FB wall with the @ signs. Yeah me! Good Job Girlie!!! That is a Bonus Entry for KIM!!! Hey I went to Injinji website. Did you check out the eco-made ones? Way cute with stripes. They have kids socks too, just as cute. What fun socks that I hope I can win. I just emailed a friend about the socks that doesn’t already know about Todayzruns’ awesome giveaways. I’m a subscriber! Love the site! I want to win!! I want to try the ex-celerator compression toe socks, and the striped ec0 toe socks, and . . . OK I want to try almost all of them! I did it on fb!! That is kind of tricky. I want to win!! You did do it!!! Good Job! Bonus Entry for Kathy. I posted a comment on my Ragnar group facebook page. I WANT TO WIN!!! I e-mailed my friends about the webiste and the socks. I’m going to say it again. I want to win!! I am a subscriber and I could always use a new pair of toes socks!